An impaired regulation of motor functions of the intestine often causes the passage of the bowel contents to be impeded. 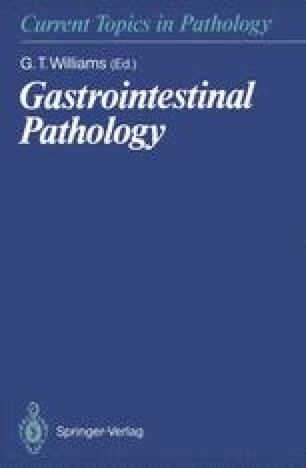 The coordination of intestinal activity is effected by an extrinsic and intrinsic enteric nervous system, the organisation of which is highly complex (Meier-Ruge 1974; Weinberg 1975; Elliott and Lawrenson 1981). In 1888 the Danish physician Hirschsprung described two patients with severe constipation caused by congenital megacolon. The history of the elucidation of the pathogenesis of Hirschsprung’s disease and the introduction of enzyme histochemical methods as diagnostic tools have been described in detail elsewhere (Ehrenpreis 1970; Meier-Ruge 1974).